On June 14, 1777, the Continental Congress created the standard for the American flag as consisting of thirteen stripes, alternating between red and white. In addition, there would be thirteen stars, one for each of the original colonies, on a field of blue. Over the years, the flag has changed. As new states were added to the union, additional stars were added on the field of blue. Every country has its own myths and legends. In America, we have many. For example, George Washington cutting down a cherry tree as a boy and when asked about this transgression stating that "I cannot tell a lie." 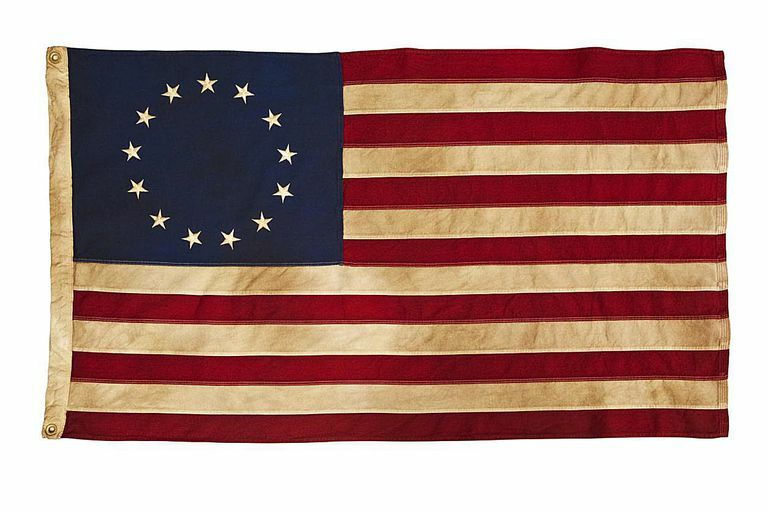 Another cherished myth related to the history of the American flag deals with one Betsy Ross — seamstress, patriot, the stuff of legend. But, alas, most probably not the person responsible for creating the first American flag. According to the legend, George Washington himself approached Elizabeth Ross in 1777 and asked her to create a flag from a sketch he drew. She then sewed this first flag for the new country. However, the story resides on shaky ground. For one thing, there is no record of this incident discussed in any official or anecdotal documents of the time. In fact, the story was not told until 94 years after the event took place by one of Betsy Ross' grandsons, William J. Canby. More interesting than this legend, however, is the origin of the original flag having a circle of stars. An artist named Charles Weisgerber actually designed the flag in this manner for the painting, "Birth of Our Nation's Flag." This painting was eventually copied into American History texts and became "fact." So what is the true origin of the flag? It is believed that Francis Hopkinson, a Congressman from New Jersey and patriot, was the true designer of the flag. In fact, the journals of the Continental Congress show that he designed the flag. For further information on this interesting figure, please see the U.S. Flag Web Site. June 14, 1777 - The Continental Congress passed the first Flag Act stating, "Resolved, That the flag of the United States be made of thirteen stripes, alternate red and white; that the union be thirteen stars, white in a blue field, representing a new Constellation." In 1949, President Harry S Truman officially named June 14th Flag Day in commemoration of this event. January 13, 1794 - Act which stated that after May 1795, there would be 15 stripes and 15 stars. April 4, 1818 - Act signed by President James Monroe stated that there would be 13 stripes and one star for each state. New states' stars would be added on July 4th after their admission to the Union. Check out this chart to see when each state was added to the Union. June 24, 1912 - For the first time, flags became standardized with specific proportions and the arrangement of the stars into six rows of eight each according to an Executive Order from President Taft. To view the specifications of the present American flag, please view this page. January 3, 1959 - An Executive Order from President Dwight Eisenhower stated that the stars would be arranged in seven rows of seven stars each. August 21, 1959 - An Executive Order from President Eisenhower resulted in the stars being arranged in nine rows staggered horizontally and 11 rows staggered vertically. Did you know? Robert G. Heft designed the current flag as a school project when Hawaii and Alaska were being discussed as possible states. He received a B minus for the assignment because his teacher said it lacked creativity. His teacher told him he would receive a higher grade if it was adopted by Congress, so he sent it on to his representative, where it eventually became the nation's flag.